I wrote about The Ride To Conquer Cancer before, but I decided to write about this again because I think it’s an important issue. On November 16 and 17, 2013 The Ride to Conquer Cancer will take place in the Auckland, New Zealand area. It’s a 2 day bike ride in which riders will cycle over 200 kilometres. The ride is to raise money for groundbreaking cancer research at the Auckland Cancer Society Research Centre, ACSRC. The ACSRC is one of the world’s most productive cancer drug development groups so the money raised to fund research will be well spend. Why is this ride on the other side of the world so important to me? As most people, I am too affected by this horrible disease in one way or another. People close to me have been diagnosed with cancer in the present and in the past. I truly believe that cancer research, no matter where it is done in the world, can make a big impact on everyone across the globe affected by it. When there is a breakthrough in cancer research, anyone anywhere in the world will eventually benefit from this! So how can we not support any research? Cancer knows no boundaries and doesn’t stop at your city’s limits or your country’s borders. With that said, Sarah (yes my cousin who I just travelled around Europe with, and who blogged here too) will be doing The Ride To Conquer Cancer in a few weeks. I’m very proud of her for doing this and I support her as much as I can. 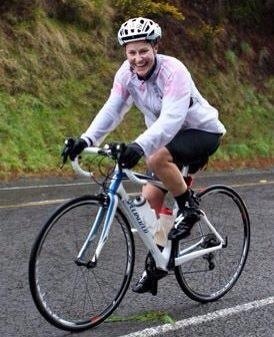 The mandatory goal to be able to participate in this ride is to raise 2,500 NZD. Which means, to even do this ride she has to raise this amount. She is nearly there and even though she is very committed to do this ride and will even front up the missing money herself to be able to do it, we can all help her help cancer research by donating something to her campaign page. Her inspiration for doing this ride is Sarah’s sister Kelly, who passed away 16 years ago to this devastating disease. So in honour of Kelly, Sarah will go all out and ride over 200 kilometres in 2 days to help raise the money needed for cancer research. So I want to help her, not only by donating to her campaign myself but also by spreading the word and hoping someone reading this will help too. Every little amount counts, so every dollar is appreciated. If you’re reading this and would like to help out too, please donate and/or spread the word about The Ride To Conquer Cancer to reach as many people as possible and hopefully we will all come together to help Sarah pass her goal of $2,500. Everyone can donate from anywhere in the world. Use the share buttons below, or link up to this post or Sarah’s Campaign Page and let’s get those dollars rolling in for Cancer Research! Sarah I’m proud of you for doing this and I really support you, I’ll be cheering for your on November 16 and 17, you can do this!